Don’t you love it when timing works in your favor? Whether it’s an empty check-out line at the grocery store or catching every green light when driving, it’s these little things that can make or break a day. A few weeks ago—the first day of spring to be exact—I was on the receiving end of good beauty timing when I used the last drop of my Clark’s Botanicals Retinol Rescue Eye Serum—and started using Juice Beauty’s Signal Peptides Firming Eye Balm. I’ve always loved an eye balm because I feel like it’s easier to apply in a controlled manner simply by patting it on with my finger. (On the other hand, if I use too much cream I wind up smearing it half-way down my face.) 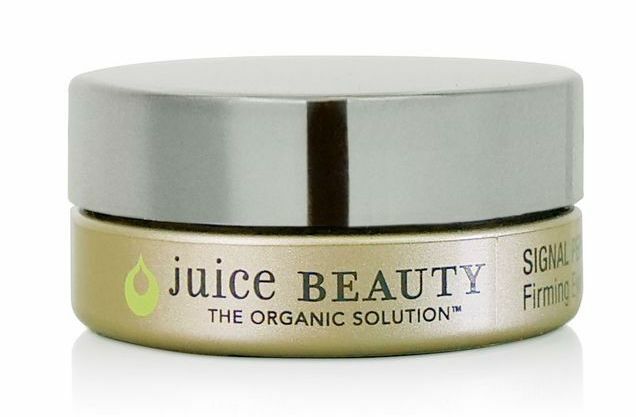 I’m really enjoying this Juice Beauty balm, as it has a rich, hydrating feel, but somehow it absorbs super quickly and leaves an almost-highlighted imperfection-blurring effect behind. But perhaps the best part is that I don’t have to be super-precise when applying to my upper eyelids—because it doubles as a brow fixative with just a few strokes of a spoolie brush. And I haven’t even gotten to the ingredients… The all-organic plant-based formula harnesses epigenetics—which is basically the theory that turning on and turning off certain genes can influence how cells act. In the case of this eye balm, peptides, paracress extract (which has been found to help collagen contract), sunflower-based lipids and wild blueberry extract are telling my skin cells to get their act together and perform more like their younger, firmer selves—and after just a few weeks I definitely notice a difference. And for the record, I’m not one of those all-organic all the time people when it comes to skincare—but it kind of makes me feel good knowing that potentially unsavory chemicals are one less thing I have to think about. Apr 3 IBB Guest Vlog: Meet Bay!